The human population is exposed to radiation continuously, which comes from various diverse sources. Some of these sources are natural, and others are the result of human activities. The radiation from natural sources includes cosmic radiation, external radiation from radionuclides in the earth's crust, and internal radiation from radionuclides inhaled or ingested and retained in the body. The amount of natural radiation exposures depends on geographical location, geological formations, and some human activities. Height above the sea level affects the dose rate from cosmic radiation. Natural radionuclides are present in the earth environment, and they exist in different geological formations such as earth's crust, air, soils, rocks, water, and plants. The environment when exposed to harmful substance can become polluted, thus producing harmful effect to human and other biotic organisms in the environment. Radionuclide sources cause pollution in the environment if allowed to build up due to natural occurrence or anthropogenic activities. Natural radioactivity is common in rock formations and soil that make up our planet earth, in waters and oceans, and in building materials everywhere. Monitoring of natural background radiation is important to humankind, and environmental protection studies on radionuclide concentration variation with geological formation, soil type, and depth profiles are relatively new in the field of radiation and radioactivity concentration studies in the environment. Therefore, the study information and survey of natural environmental radiation are of great importance and interest in health physics, not only for many practical reasons, but also for more fundamental scientific reasons., The earth's crust contains radionuclides which constitute the major source of naturally occurring radioactive materials (NORMs) in the environment. Most of these radionuclides are members of the radioactive decay series,238 U,235 U, and 232Th. The members of these chains undergo radioactive decay, which is a spontaneous process in which a radioactive nucleus transmutes into one or more constituent elements, eventually decaying into a radioactively stable isotope. The change from the “parent” nuclei into a different element or “daughter” nuclei is also referred to as nuclear transmutation, which is usually accompanied by the emission of alpha and/or beta particles. According to the UNSCEAR, 2000, there exist about 340 naturally occurring nuclides, of which about 70 are radioactive and are found mainly among the heavy elements, with A >200. The earth is exposed to ionizing radiation and as a result, radioactive materials can be found in our foods, soil, air, water, and building materials., The human body contains radionuclides such as 40K and 14 C. Radiation is ubiquitous and thus exposure to gamma-ray-emitting radionuclides cannot be completely avoided. Every day, we are exposed to radiation of different kinds originating from different sources. We receive radiation exposure from cosmic rays, outer space, radon gas, and from other natural radioactive elements in the earth. This radiation is called natural background radiation including the radiation we get from plants, animals, and from our own bodies. Furthermore, we are exposed to radiation from human-made sources such as medical and dental treatments, television set, and emission from coal-fired power plants. This research aims to survey and implement a radiometric analysis for several international studies to provide data and baseline map of radioactivity background level in the environment. This can be used as reference information to assess any changes in the radioactive background level due to geological processes. The present study contributes immensely to the understanding of the characteristics of natural background radiation. Samples such as rock and soil were taken from the study areas and then crushed into small pieces and ground to powder of suitable powder size. Each sample was dried in an oven at 105°C or suitable temperature and sieved through appropriate mesh for optimum size minerals. The sample was packed in suitable plastic container. The sample was weighed and stored for a minimum suitable period of 1 month to allow the daughter product to come into radioactive equilibrium with their parent 226 Ra and 232Th and then counted for 8–12 h depending on the concentration of radionuclide. One of the most valuable techniques for low-level radioactivity measurements is gamma- ray spectrometry. The various systems, consisting of scintillation and semiconductor detectors coupled to multichannel analyzers, provide for rapid simultaneous measurement of many radionuclides in the same sample. HPGe detector is preferred for the determination of radionuclides in food and environmental samples because of the higher resolving power (energy resolution = full width at half maximum) of the HPGe detector than that of the NaI (Tl) detector; high-energy resolution is essential for the analysis of the complex γ-spectra. NaI (Tl) scintillation is preferred when high-energy resolution is not essential. The energy resolution of NaI (Tl) crystal (3” × 3”) is about 6% for the photopeak of 137 Cs at 661.6 keV (i.e., it is about 40 keV) and about 60 keV for the photopeak of 60 Co at 1332 keV, whereas the energy resolution of HPGe detectors is about 1.9 keV for the photopeak of 60 Co at 1332 keV. The energy calibration of HPGe detector or NaI (Tl) scintillation detector system should be made by measuring standard sources of known radionuclides with well-defined energies within the energy range of interest, usually 60–2000 keV. To measure the main natural gamma-ray emitters by NaI (Tl), the efficiency should be known at least from 239 (212 Pb) to 2614 keV (208 Tl). The measurement apparatus has to be properly shielded with a lead cover in order to limit the environmental radioactivity impact. Among the natural radionuclides of interest for radiation protection issue, only 40K is directly measurable by gamma spectrometry through its photopeak at 1460.83 keV, characterized by an emission probability of 10.67%.238 U is not easy to detect by gamma-ray spectrometry due to the low energy and emission probability of the photopeaks of its first-decay products. However, since in the 238 U series, approximately 98.5% of the radiological effects is engendered by 226 Ra and its progeny, the specific activity of 238 U could be assumed to be equal to that of 226Ra, neglecting its precursors. 226Ra can be detected by its photopeak at 186.1 keV directly, also can be measured indirectly by taking into account of 222 Rn decay products, for example,214 Pb (photopeak at 351.93 keV, with an emission probability of 35.1%) or 214 Bi (609.31 keV, 44.6%). In this case, secular equilibrium between radon and its daughters must be ensured. Gamma spectrometry is not sufficiently efficient to directly measure the photopeaks of 232Th since they are characterized by low energy and emission probability. For this reason, the photopeaks of some of its decay products, such as 228 Ac (911.2 keV, 25.8%),212 Pb (238.63 keV, 43.3%), or 208 Tl (583.19 keV, 30.4%), should be measured with the aim of evaluating the specific activity of 232Th. The energy and counting efficiency calibrations are required. It is important to maintain the same experimental conditions of the calibration step, such as counting time, photopeaks, volume, geometry, and position of the sample. Counting efficiency for all the energies of interest has to be evaluated by means of suitable standardized calibration sources, characterized by a density near to that of the sample. The contribution of the background has to be evaluated by measuring a blank with the same volume and dimensions of the sample. Moreover, a counting time of at least 60,000 s is required to achieve better counting statistics. The counting time of the sample has to be chosen so as to reduce the statistical uncertainty to obtain a reliable and accurate measure. In particular, the counting time is governed by the radioactivity of the sample, detector-to-source distance, and acceptable Poisson counting distribution uncertainty. Finally, with regard to the data analyses, the total net counts have to be determined from the measured spectra, considering the Compton continuum subtraction. Each specific activity has to be evaluated by taking into account the mass of the sample, blank measurement, and counting efficiency. The standard deviation associated with each radionuclide and the lowest detectable limit have to be evaluated. Terrestrial radiation is emitted by natural radioactive materials present in the earth's crust in the rocks, soils, water, air, and vegetation. These include primordial radionuclides such as uranium, thorium, and their daughter products such as radon and thoron. The annual effective dose of terrestrial radiation is 0.48 mSv/y for external exposure and 0.29 mSv/y for internal exposure to individuals. The UNSCEAR, 2000, has reported that, from terrestrial grounds, humans receive an average dose of 59 nGy/h worldwide. The levels of natural background radiation were increased at specific areas in some countries like Iran, India, and Brazil, and the dose rate of 17, 28, and 90 μGy/h, respectively, will be converted into equivalent dose using gamma radiation of unity. The terrestrial radiation sources are varying significantly from place to place. These belonged to soil surface and building materials. The earth's atmosphere is continuously bombarded with high-energy cosmic rays which originate from the cosmos. The primary interaction of high-energy cosmic rays with the atmosphere produces a number of secondary radiations in the form of neutrons and protons of various energies, which in turn produce a variety of radionuclides through nuclear reactions with nitrogen, oxygen, and other nuclei present in the atmosphere and through other processes. In addition, subatomic particles such as mesons, muons, and electrons are also produced. The production rate of these radionuclides and particles varies appreciably with both altitude and latitude, but is relatively constant with time. About 70% of the cosmogenically produced radionuclides are produced in the stratosphere, while the remainder is formed in the troposphere. Moreover, the natural dose rates from cosmic radiation depend strongly on the altitude and slightly on the latitude. The latitude effect is due to the charged particle nature of the primary cosmic rays, and the effect of the earth's magnetic field, which tends to direct ions away from the equator and toward the poles. The prominent radionuclides produced due to cosmic ray interaction with the atmosphere are 3 H,7 Be,14 C, and 22 Na. Beryllium-7 is a commonly identified beryllium radioisotope present in our environment. The ambient dose rate at sea level due to cosmic rays is estimated to be 31.96 nGy/h for India. The UNSCEAR (2000) has given a value of 31 nGy/h as the worldwide representative value for the ambient dose due to the cosmic rays at sea level. 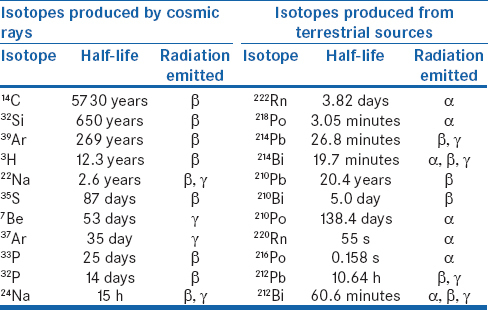 [Table 1] presents the details of some of the important radionuclides produced by the cosmic rays and terrestrial sources which are of interest present in the atmospheric environment, respectively. The radioactive minerals present in the construction materials are the main sources of gamma radiation apart from the natural background radiation of the location. Recently, there is a tendency to use building materials which may contain naturally or technologically enhanced levels of radioactivity in high-background radiation areas. Therefore, most of the building materials contain high levels of primordial radionuclides and other radionuclides. Human beings who spend more than 80% of their time in the houses and office buildings are exposed to radiation emitted by the radionuclides present in the building materials. For example, the average person in the UK spends only 8% of his/her time out of doors. We receive most gamma radiation from building materials, while most Radon (222 Rn) emits from the ground underneath a building. Geology is the very important factor controlling and impacting the source and distribution of gamma radiation and radon gas, so areas of high level of radon potential and natural radioactivity can be mapped using geological and geophysical information. However, the results of dose rate to the population depend on additional factors such as soil type, house construction, and life style. The relationship between concentrations of radon in houses and lung cancer has been analyzed in some countries in the world such as Germany, China, Canada, Finland, Sweden, the USA, and the UK, all these studies indicate that higher lung cancer rates occur in people exposed to higher levels of radon gas. [Table 2] presents typical values of NORM in constructing common building materials used in different countries of the world, both as structural materials and covering layers., where granite shows the highest range of radioactivity in building materials. NORMs have been present in the earth's crust since it was formed approximately 4.5 billion years ago. These include radioactive decay chains headed by 238 U,235 U, and 232Th, as well as 40K,87 Rb, and other radioactive isotopes.235 U is present in such small amounts (0.7%) compared to 238 U (99.3%) that it contributes a relatively very minor radiation dose and therefore is not considered further. Many scientists and researchers in the world worked in the field of analyzing soil and rock samples to show the natural radioactivity levels and associated radiological hazards in the environment by using gamma-rays spectroscopy system since most soil and rock samples contain naturally occurring radioactive elements. The members of two natural radioactive series, which can be represented by the isotopes 238 U,232Th, and primordial radionuclide 40K, are the most important radioisotopes. The presence of these radioisotopes in the rocks and soils causes external and internal exposure to the people.226 Ra (238 U series) can also enhance the concentration of 222 Rn and of its daughters in the house. The study of radioactivity levels and dose rate in environmental rock samples from Taiz, Yemen, was implemented. The results showed that the mean activity concentrations of 226 Ra,232Th, and 40K were found to be 65.58 ± 1.38, 82.93 ± 0.93, and 976.40 ± 6.11 Bq/kg, respectively. These values exceed the maximum international reference values (UNSCEAR, 2000) of 35, 30, and 400 Bq/kg, respectively. In addition, an X-ray analysis showed that there are considerable concentrations of heavy metals such as Fe, Al, Zr, and Ti. The natural radioactivity and radiation hazards in soil samples collected from some areas of Himachal Pradesh, India, were measured using gamma-ray spectrometry. The results of the activity concentrations of 226 Ra and 232Th in soil samples collected from these regions are higher and 40K is lower than the world average value. The external exposure dose has been determined from the content of these radionuclides in soil. The study gives an annual effective dose in the range of 0.07–0.13 mSv. The natural ionizing radiation exposure of the Spanish population was reported. The annual average effective dose is estimated to be 1.6 mSv. Radon doses were estimated from natural surveys carried out throughout the country. To assess doses by ingestion, a detailed study on consumption habit in Spain has been considered. In Italy, a study on natural radioactivity and radon exhalation in building materials in Italian dwellings was carried out. The study showed that several of the materials had hazard indexes that exceeded the European Commission limit values. Moreover, it was conforming that radon emanation from glazed tiles and basalt was lower than the radon emanation from other materials with similar hazard indexes. The natural radionuclide levels in beach sediments collected from the northeast coast of Tamil Nadu, India, were determined using gamma-ray spectrometric technique. The mean activity concentrations of 238 U,232Th, and 40K and radiation hazard indices were calculated, and it was found that all the values were lesser than the worldwide average values. On the basis of lower levels of natural radioactivity, beaches of the northeast coast of Tamil Nadu in India can be considered as a low natural background radiation area. In Juban town in Yemen, natural and anthropogenic radioactivity levels in soil and rock samples were assessed. The activity concentration of 226 Ra,232Th, and 40K for the soils was 44.4 ± 4.5, 58.2 ± 5.1, and 822.7 ± 31 Bq/kg, respectively.137 Cs was found in the investigation study area with low-level deposits and its activity concentrations ranged from 0.1 ± 0.1 to 23.2 ± 1.2 Bq/kg. Radionuclides in rock samples collected from southern part of Nigeria have been measured using gamma-ray scintillation spectrometry. The absorbed dose rate and gamma radiation exposure (annual effective dose) ranged from 0.012–0.042 to 0.06–0.21 mSv/y, respectively, implying that the radiation from rocks is below the world average background. The radioactivity levels depend on the rock type. Granite rocks had the highest (882 ± 298 Bq/kg) activity concentration of 40K because of the high silica content and fairly high (131 ± 43 and 129 ± 38 Bq/kg) activity concentration for 232Th and 238 U, respectively. The outdoor gamma radiation exposure dose rate was estimated due to the activity concentration of radionuclides 40K,238 U, and 232Th in the soil in 18 cities across different environments in Nigeria. The report revealed 0.102 ± 0.032 μGy/h for the northern part, 0.089 ± 0.014 μGy/h for the western part, and 0.040 ± 0.006 μGy/h for the eastern part of the country. [Table 3] shows a summary of concentrations of major natural radionuclides in major rock types and soil in different geological formations. It can be noted that granite and salic types have high levels of radioactivity comparatively with other types of rocks. The radionuclide concentration in different environmental matrices of high-background radiation areas of coastal Kerala was measured. The soil samples collected from sea waterline at different depths and at different distances were then analyzed for primordial radionuclides using gamma-ray spectrometry. The activity concentration of potassium was under the detectable level in most of the samples collected from the high-background areas. No definite correlation was found between the variation of 232Th and 226 Ra concentrations with depth. The analysis of primordial radionuclides in soils from Hassan district of South India was carried out using NaI (Tl) detector. The calibration of gamma-ray spectrometer was done using standard sources such as RG-U, RG-Th, and RG-K, procured from the International Atomic Energy Agency, Vienna. The study noted that the radionuclide concentration varied from place to place due to the presence of different geological formations of the region. Relatively higher activity of 232Th was observed in this study. The Raeq was found below the recommended limit of 370 Bq/kg. The calculated absorbed gamma dose rate in air ranged from 49 to 116 nGy/h, with a mean value of 71 nGy/h, and the radiological hazard parameters were found within the safety limits. The radon exhalation rate in sand samples collected from the newly discovered high-background radiation area at Erasama beach placer deposit of Orissa, India, was assessed. Radon exhalation rates were measured by “Can” technique using LR-115 Type II plastic track detector to estimate the radiation exposure in atmosphere. The sand samples collected from Erasama beach contain the heavy minerals. The natural radioactivity in the sediment samples collected from Pulicat Lake to Vada Nemmeli of Chennai coast, East coast of Tamil Nadu, India, had been measured using gamma-ray spectrometry NaI (Tl) detector. The study showed that the average concentrations of 238 U,232Th, and 40K were 10.14, 35.02, and 425.82 Bq/kg, respectively, in sediments, which are around the world average values (35, 30, and 400 Bq/kg, respectively) defined by the UNSCEAR, 2000. The calculated radium equivalent activity (Raeq) of the sediment samples showed lower than the recommended safe limit of 370 Bq/kg. Radiological investigations recently carried out in the Eastern coast of Odisha, India, to measure the radiation dose rates have revealed that there is an enhanced level of natural radiation in the area. The activity concentration of 232Th was found to be 2825 Bq/kg, whereas that of 238 U was 350 Bq/kg. Measurement of natural radioactivity in some selected rock samples from Dhanbad city of Jharkhand, India, was done using gamma-ray spectrometry. The study showed that the activity concentrations ranged from detection limit to 3.08 Bq/kg for 226 Ra and 5.35−37.39 Bq/kg for 232Th and 168.8−416.9 Bq/kg for 40K. The concentrations of these radionuclides were compared with the recommended values. The study results showed that the Raeq due to natural radioactivity was 51.34 Bq/kg in the rock samples, which is very low compared to the world average of 370 Bq/kg. The average values of indoor and outdoor annual effective dose rates (0.125 and 0.016 mSv/y, respectively), external hazard index (Hex: 0.14), internal hazard index (0.13), and gamma level index Iγ (0.20) were found to be lower than the internationally acceptable values. Hence, all the rock samples do not pose any significant source of radiation hazard, and the use of the rock samples in the construction of dwellings is considered to be safe for inhabitants. The radionuclides in soil samples collected from Hamirpur district, Himachal Pradesh, India, were analyzed. The specific activity concentrations of natural radionuclide 226 Ra,232Th, and 40K in the selected soil samples was analyzed using gamma-ray spectrometry, NaI (Tl) detector. The gamma ray lines of 1.46, 1.76, and 2.62 MeV, respectively, were employed for potassium, radium, and thorium estimation. Natural background gamma radiation levels in and around Loktak Lake of Manipur, India, and natural pollution level due to terrestrial gamma radiation were measured using NaI (Tl) scintillator-based Micro-R-survey meter and high-purity germanium detector. The averaged reported values of radioactivity concentrations of 226 Ra,232Th, and 40K were 74.6, 112.1, and 792.9 Bq/kg, respectively, and the average value of the annual effective dose in this study was 0.7 ± 0.1 mSv/y, which is higher than the world average value of about 0.4 mS/y reported by UNSCEAR, 2000. The estimated radionuclides (226 Ra,232Th, and 40K) were comparable with the reported values for many countries in the world and different places of this country. The level of terrestrial gamma radiation and associated dose rates from the naturally occurring radionuclides 232Th,238 U, and 40K in ten soil samples collected from Thanjavur (Tamil Nadu, India) were assessed using gamma-ray spectrometry. The activity profile of radionuclides had clearly showed the existence of low-level activity in Thanjavur. The average value of activity concentrations of 232Th,238 U, and 40K was 42.9 ± 9.4, 14.7 ± 1.7, and 149.5 ± 3.1 Bq/kg, respectively. Absorbed dose rates in air outdoors were variation between 32 and 59.1 nGy/h, with an arithmetic mean of 43.3 ± 9 nGy/h. This value is lower than the population-weighed world average of 60 nGy/h. Moreover, the annual effective dose value ranged between 39.2 and 72.6 μSv/y with an arithmetic mean of 53.1 ± 11 μSv/y. The values of the Hex were found to be lower than the recommended safe levels. The distribution of radionuclides in Indian soils had been studied, and it has been reported that the terrestrial dose rates range from 18 to 144 nGy/h, and the contribution of I37 Cs toward the external dose is very small. Some places in peninsular India like Hyderabad and Visakhapatnam and Chingleput located in the East coast exhibit higher concentrations of 232Th compared to that of other normal areas of India. The radioactivity level of 238 U and 232Th in soil samples from monazite regions in India varies up to 3400 and 15,400 Bq/kg, respectively. Assessment of natural radioactivity and radiation index parameters in sand samples collected from the coastal belt of Kerala had been carried out using NaI (Tl) detector. This study reported that, in certain situations, the natural radioactivity in the environmental matrices can reach reference levels or beyond. Hence, this study had been performed to understand the distribution and enrichment of natural radionuclides in the coastal environment of Kerala, thereby assessing dose to the inhabitants. The assessment showed that the activity concentration of 226 Ra and 40K is well within the permissible limit, but the concentration of 232Th was found higher compared to the world and Indian average values. The sand weathered from the rocks, which are rich in heavy metals and radioactive minerals, can contribute to the enhanced level of 232Th activity. In this article, the values for the indoor and outdoor annual effective doses were of the same order as that of world average value of 0.48 mSv. The concentration of radionuclides in foods is varying and is dependent on several factors, such as the type of food and the geographic region where the food has been produced. Every food has some small amount of radioactivity in it. The concentration of natural radioactivity in food is often in the range of 40–600 Bq/kg of food. In the human body, the concentration of activity of potassium (40K), carbon (14 C), tritium (3 H), polonium (210 Po), and 226 Ra is 63, 66, 133, 0.0002, and 2.7 × 10−5 Bq/kg, respectively. 40K, 226Ra, and 238 U and their associated progeny are the common radionuclides found in food. In general,40K is the most commonly occurring natural radioisotope. For example, levels of 40K in milk measure around 50 Bq/kg, 420 Bq/kg in milk powder, 125 Bq/kg in beef, 165 Bq/kg in potatoes, and for bananas, meat, and other potassium-rich products, levels of radionuclides may measure at several hundreds Bq/kg. Other natural radioisotopes exist in much lower concentrations and originate from the decay of uranium and thorium. [Table 4] summarizes the amount of natural radioactivity of some common foods. Children and adults receive annual doses of 185 and 165 μSv, respectively, from 40K naturally present in their bodies. The higher dose received by children is due to a higher potassium concentration in the diet in relation to body mass. Moreover, the representative average annual individual dose of 175 μSv has been determined to this exposure pathway. Cosmic rays produce neutrons which interact with nitrogen in the upper atmosphere to produce carbon-14. About 9 kg approximately of carbon-14 is produced in this way every year. This 14 C is distributed throughout the environment worldwide and, because carbon is a key component of living material, carbon-14 is present in trees and plants and therefore also in the food chain. Foods high in fatty acids are normally high in carbon. These include oils, milk products, avocados, almonds, walnuts, and fish such as mackerel, trout, and salmon. Cereals also tend to have high carbon-14 concentrations. UNSCEAR, 2000, has estimated that the worldwide average per caput dose from carbon-14 in the diet from nuclear weapons' testing is 1.7 μSv. While this value is now somewhat dated, the long half-life of carbon-14 along with its behavior in the environment means that this is a reasonably accurate estimate of the current exposure levels. Humans are always exposed to a spread of radionuclides present in the air, water, soil, rock, food, and building materials. The concentration of radionuclides in soils is an indicator of radioactive accumulation in the environment, which affects humans, animals, and plants. These radionuclides have long life, with half-lives often about hundreds of millions of years. Exposures to natural sources are due to (a) cosmic rays, (b) source of terrestrial origin, (c) indoor inhalation exposures due to 222 Rn and their daughters, and (d) internal exposure from radionuclides taken into the body through the ingestion of food materials, etc., Exposures depend on the location, elevated levels of NORMs in specific localized regions, and human activities and practices. Especially, building materials of houses and the design and ventilation systems strongly influence the indoor levels of radon and its decay products, which contribute the doses through inhalation. The global value of total contribution from the natural sources to the population works is 2.4 mSv/y. Most of the exposures are produced by the radioactivity of the natural radionuclides present in the environment. The authors would like to thank the editor and reviewers of the Journal of Radiation Protection and Environment (RPE) for their careful reading of our manuscript and their useful comments and suggestions. Gur F, Baba A, Kumru MN. Assessment of the Radiological Impact of Soil in Izmir. Izmir, Turkey: International Earth Science Colloquium on the Aegean Region; 2001. p. 89-98. Tzortzis M, Svoukis E, Tsertos H. A comprehensive study of natural gamma radioactivity levels and associated dose rates from surface soils in Cyprus. Radiat Prot Dosimetry 2004;109:217-24. Abbady A, Ahemed NK, El-Arabi AM, Michel R, El-Kamer AH, Abbady AG. Estimation of radiation hazards indices from natural radioactivity of sum rocks. Nucl Sci Tech 2006;17:188-22. Al-khawlany AH, Khan AR, Pawar PP, Pathan JM. Measurement of activity concentration levels of radionuclides and associated hazard indices in soil samples collected from Aurangabad, Maharashtra-India. Int J Sci Eng Res 2017;8:1586-93. United Nations Scientific Committee on the Effects of Atomic Radiation. Sources and Effects of Ionizing Radiation, UNSCEAR 2000 Report to the General Assembly. Sources. Vol. 1. New York: United Nations; 2000. Wilson AJ, Scott LM. Characterization of radioactive petroleum piping scale with an evaluation of subsequent land contamination. Health Phys 1992;63:681-5. Al-Khawlany AH, Khan AR, Pathan JM. Assessment of natural radioactivity levels and associated radiological hazards for some environmental soil and rock samples from outskirts of Aurangabad, India using gamma-ray spectrometry. Int J Innovative Res Sci Eng Technol 2017;6:16592-604. Thompson A, Huxley CL, Gill TS, Carroll LS. Environmental geology in land use planning: A Guide to Good Practice, Report to the Department of the Environment, Transport and the Regions, Symonds Travers Morgan, Architects-Cantelupe Rd, East Grinstead; 1998; pp. 80. ASTM. Standard.C.1402: Standard guide for high-resolution gamma-ray spectrometry of soil samples. ASTM International, West Conshohocken, PA; 2009;12:1-9. United Nations Scientific Committee on the Effects of Atomic Radiation. Sources and Effects of Ionizing Radiation, UNSCEAR 2008 Report to the General Assembly. Annex B: Exposures of the Public and Workers from Various Sources of Radiation. Vol. 1. New York: United Nations; 2010. Achola SO, Patel JP, Mustapha AO, Angeyo HK. Natural radioactivity and external dose in the high background radiation area of Lambwe East, Southwestern Kenya. Radiat Prot Dosimetry 2012;152:423-8. National Council on Radiation Protection (NCRP). Measurement of radon and radon daughters in air. NCRP Rep. No. 97, United States, Bethesda, MD, Maryland; Environmental Measurements Laboratory New York; 1988. Nambi KS, Bapat VN, David M, Sundaram VK, Santa CM, Soman SD. Natural Background Radiation and Population Dose Distribution in India. India: HPD, BARC; 1986. Zikovsky L, Kennedy G. Radioactivity of building materials available in Canada. Health Phys 1992;63:449-52. Appleton D. Natural Radioactivity and Health: The Risks Posed by Exposure to Ionizing Radiation. Vol. 21. Earth wise: British Geological Survey; 2004. p. 16-7. United Nation Scientific Committee on the Effects of Atomic Radiation (UNSCEAR). Effects and Risks of Ionizing Radiation. Report to the General Assembly. New York: United Nations; 1988. Ridha A. Determination of Radionuclides Concentrations in Construction Materials Used in Iraq. Ph.D. Thesis. College of Science, AL-Mustansiriyah University, Iraq; 2013. p. 23-214. Al-Abyad M, El-Kameesy SU, El-Fiki SA, Dahesh MN. 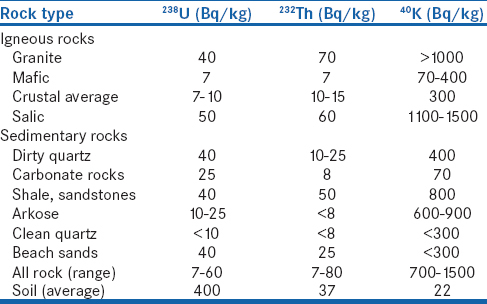 Radioactivity levels and dose evaluation in some environmental rock samples from Taiz, Yemen. Glob J Phys 2016;4:266-75. Rani A, Singh S. Natural radioactivity levels in soil samples from some areas of Himachal Pradesh, India using gamma ray spectrometry. Atmos Environ 2005;39:6306-14. García-Talavera M, Matarranz JL, Martínez M, Salas R, Ramos L. Natural ionizing radiation exposure of the Spanish population. Radiat Prot Dosimetry 2007;124:353-9. Righi S, Bruzzi L. Natural radioactivity and radon exhalation in building materials used in Italian dwellings. J Environ Radioact 2006;88:158-70. Ramasamy V, Senthil S, Gajendran V. Measurement of natural radioactivity in beach sediments collected from North East coast of Tamil Nadu, India. Res J Appl Sci Eng Technol 2009;1:54-8. Abb El-Mageed AI, El-kamel AH, Abbady AJ, Harb S, Youssef AM, Saleh II. Assessment of natural and anthropogenic radioactivity levels in rock and soil in the environment of Juban town in Yemen. Radiat Phys Chem 2011;80:710-5. Joshua EO, Ademola JA, Apanowa MA, Oloronde D. Natural radionuclides and hazard of rock samples collected from south Eastern Nigeria. J Radiat Meas 2009;44:401-4. Farai IP, Jibiri NN. Baseline studies of terrestrial outdoor gamma dose rate levels in Nigeria. Radiat Prot Dosimetry 2000;88:247-54.
International Atomic Energy Agency. Extent of Environmental Contamination by Naturally Occurring Radioactive Material (NORM) and Technological Options for Mitigation. Technical Reports Series No. 419. Vienna: International Atomic Energy Agency; 2003. Jagadeesha BG, Narayana Y. Natural radionuclide concentration in Hassan district of South India. Radiat Prot Environ 2018;41:37-41. Kumar R, Mahur AK, Rao NS, Sengupta D, Prasad R. Radon exhalation rate from sand samples from the newly discovered high background radiation area at Erasama beach placer deposit of Orissa, India. Radiat Meas 2008;43:S508-11. Tholkappian M, Chandrasekaran A, Harikrishnan N, Ganesh D, Elango G, Ravisankar R. Measurement of natural radioactivity in and around Chennai coast, east coast of Tamil Nadu, India, using gamma ray spectrometry. Radiat Prot Environ 2017;40:9-12. Mohanty AK, Vijan SD, Saha SK. Natural radioactivity in the newly discovered high background radiation area on the eastern coast of Orissa, India. Radiat Meas 2004;38:153-65. Zubair M. Measurement of natural radioactivity in rock samples using gamma ray spectrometry. Radiat Prot Environ 2015;38:11-3. Singh S, Singh B, Kumar A. Natural radioactivity measurements in soil samples from Hamirpur district, Himachal Pradesh, India. Radiat Meas 2003;36:547-9. Sharma AB, Singh NS. Assessment of natural background gamma radiation levels in and around Loktak Lake of Manipur, India. Radiat Prot Environ 2018;41:94-8. Senthilkumar B, Dhavamani V, Ramkumar S, Philominathan P. Measurement of gamma radiation levels in soil samples from Thanjavur using gamma-ray spectrometry and estimation of population exposure. J Med Phys 2010;35:48-53. Sadasivan S, Shukla V, Chinnaesakki S, Sartandel S. Natural and fallout radioactivity measurement in Indian soils. J Radioanal Nucl Chem 2003;256:603-7. Vineethkumar V, Kaliprasad CS, Prakash V. Assessment of natural radioactivity and radiation index parameters in the coastal environment of Kerala. Radiat Prot Environ 2018;41:99-103. Shahbazi D, Gholami M, Setayandeh S. A review on natural background radiation. Adv Biomed Res 2013;2:1-6. Mishra M. Study of Natural Ambient Radioactivity in the Environment and some Materials. Ph.D. Thesis. Department of Applied Physics, Z. H College of Engineering and Technology, Aligarh Muslim University, Aligarh (India); 2008. p. 8-48. Colgan PA, Organo C, Hone C, Fenton D. Radiation doses received by the Irish population (No. RPII-IE--08/01). 3 Clonskeagh Square. Dublin 14: Radiological Protection Institute of Ireland (Ireland) 2008: pp. 25-53.